Queen & Company Black Friday Sale! Hi everyone! Have you seen Queen & Company’s Black Friday Sale? There are lots of good deals to be found! I think the prices are already great, but now? I definitely recommend checking it out! (Run!) Today I have two cards to share using some of those awesome bargains! First I created a Congrats card using the Oval Foam Front Shaker kit. I die-cut the frame using the corresponding Oval Designer Die and papers from Delightful Dots and Pretty Presents paper pads. 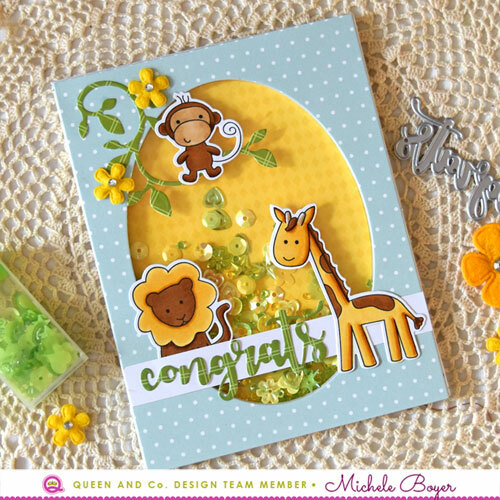 The cute yellow flowers are one of many items included in Queen & Company’s Black Friday Rainbow Binder. The binder includes eight colors each of rhinestones, pearls, buttons and flowers. It’s an *amazing* deal! Next I created a “hugs” card using Bubbles Foam Front Shaker Kit and coordinating Designer Die. The black pearls are from the Rainbow Binder, and patterned paper is from Fruit Basket Mat Stack. I love the bright colors! Be sure to check out Queen & Company’s Black Friday sale HERE. You won’t want to miss it! This entry was posted in Clean and Simple (CAS), Copic, My Designs, Queen & Co.. Bookmark the permalink. Oh my !! How adorable are these two cards ! !